Every year, my dad Santa Claus writes the kids letters. These letters are one of my favorite parts of Christmas. Enjoy! Well, here we are together again, on your fifth Christmas. After five Christmas Eve visits (and four years of checking up on you) I hope my visit is expected. I look forward to it all year. As you know, I live at the North Pole. I got there because I am a citizen of all countries of the world, and the North Pole is one of the few places on earth that everyone owns together. A North Pole residence comes with a few perks, like my own post office, and its gets quite busy when the elves arrive after Thanksgiving. (Most people don’t know it, but the elves are contractors who rotate with the seasons. As soon as they finish with my gift list they move to China to make Chinese New Year lanterns and dragons, then on to Guatemala to make pinatas for Cinco de Mayo, then to Germany where they help with Oktoberfest.) But mostly the North Pole is cold. And dark. And lonely. It’s a place I never expected to live, and would not, except for what I have been called to be. What makes it tolerable is the lights. Even during those long stretches when the sun is hidden, the sky is alive with dancing, streaming lights. Scientists explain that charged particles from the sun are interacting with the earth’s magnetic field. I prefer the observation of the prophet Isaiah, that “the people walking in darkness have seen a great light.” Isaiah’s light, of course, is the promise of Emmanuel, God With Us. God is with us, Grayson, you and me. I know you never expected to live with feeding tubes and seizures, hospital confinements and retching, except for what you have been called to be. I know it’s hard, and dark, and lonely, but I also know that you, too, see the lights. They stream when your mother sings to you and your father boosts you and your sister hugs you. They dance when Mary comforts you and Grammie kisses you and Granddaddy pushes you up the hill at the ranch. God is with us, Grayson, you and me. The Christ Child who was born this night makes it so. So, Grayson, know that I was here this evening, as I will be every year. Know that there will always be something in my sack for you. I think of you often, every time I see the lights. What’s with the staying awake so long? You know my whole itinerary is based on children being asleep when I arrive! I had to make a mid-course correction over Luxembourg and swap the order of two Canadian provinces while you were resisting bed time. I guess it’s because you are just like me – places to go, things to do. Let’s see, since last year you have been walking and talking, counting and talking, singing the family song and talking, and naming your colors, shapes, and animals. Not to mention talking. The Christ Child who was born this night also did these things. The Bible says he “grew in wisdom and stature”. God made sure of it because that Child was born to be the savior of the world. Charlotte, you too were born for a wonderful purpose. I see it in your energy and your intelligence and the twinkle that is always in your eyes. I see it in your curiosity and your persistence. I see it in the laughter that follows wherever you go. But mostly I see it in your heart. You are a loving young lady who knows she is loved. You were given to us all by the Architect of the Universe who delights in your enthusiasm as His plans for you unfold. As you might expect, Mrs. Claus and I must be very selective about the pictures we put on our refrigerator. One reason is that we receive so many pictures, another is that we do not need a very large refrigerator at the North Pole. We will always make a place, however, for the picture of you hugging your brother Grayson. You know that Grayson is a special child of God, and you are special for being such a caring, loving sister. When your parents read this to you it will be Christmas day, and another visit from Santa and his reindeer will have been accomplished. Soon the food will be eaten and the decorations put away, but I know that the memories will remain. Until next year, Charlotte, I’ll be watching as you grow in wisdom and stature. 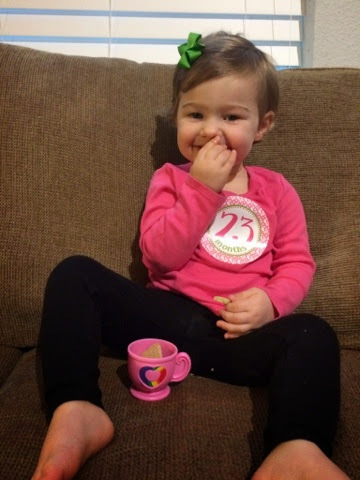 Oh my Charnado, here we are- you are almost 2! 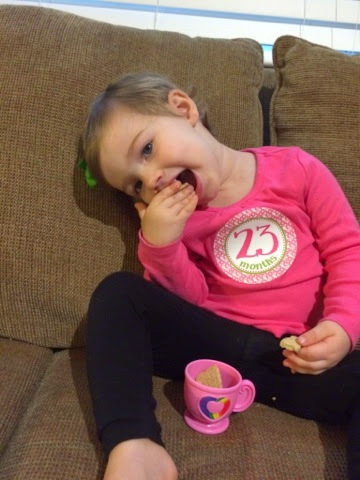 When people ask me how old you are these days, I always answer that way- “Almost 2”, because you are most definitely the embodiment of a two year old. You are silly, sweet, defiant and frustrating at times, and full of endless energy. Daily, you make me question what the heck I am doing and doubt my abilities as your mother, yet fill me with so much joy and pride. I am so proud of you. You are incredibly smart, verbal, and caring. I love you so, so much. I’m not exactly sure how much you weigh because I forgot to weigh you before we left for the ranch yesterday, but I think you’ve lost weight since last month. You gave up your bottle cold turkey about a month ago and have slimmed down noticeably. You also have way less wet diapers, but are still drinking plenty of water. Since you slimmed down some, you are mostly wearing 24 month clothing, especially pants, and 2T tops. You are still in size 5 shoes and size 5 diapers. You now have a mouth full of teeth. You have developed a love for art, which makes me so happy. You spend a lot of time each day coloring with crayons, and your teachers tell me you are always the most enthusiastic about the craft projects you do at school. I can’t wait to see what Santa brings you this year- hint, hint. We have developed a new little bedtime routine since you gave up the bottle. Mary (Grayson’s nurse) gives you a shower, then you and me go upstairs and read a few books (You have The Very Hungry Caterpillar memorized and can almost quote it word for word). After that we talk about our “super fun day”- we go through all the things we did that day, and then we say your prayers and sing a few songs. You still get very upset with me most nights when I actually put you in your crib, but after a few minutes of screaming, settle down and go to sleep. When we ask your name, you say “Baker. Charlotte Baker”. We also have Mommy Baker, Daddy Baker and GG Baker in our house. You love Daniel Tiger, and so do I. It’s really nostalgic to me, since I loved Mr. Rogers Neighborhood as a kid. I probably let you watch way too much of it a day, but Daniel is so sweet and has such good lessons, I’m not too worried about it. Your favorite Daniel Tiger is the potty episode. You love to talk about the potty, washing your hands, wearing underwear and no more diapers, etc. but have no interest in actually sitting on the potty yourself. You are starting to be really particular about certain things and have meltdowns when they aren’t done to your specifications. Your water cup, for example- aaaaa! We have more “arguments” about your water than anything else. You beg for animal crackers all day long. Oh, and your gummies and vitamins. You get 4 gummies and 1 vitamin a day- THAT’S IT! Your birthday is a month away and I don’t know what we are going to do to celebrate, but celebrate YOU we will. 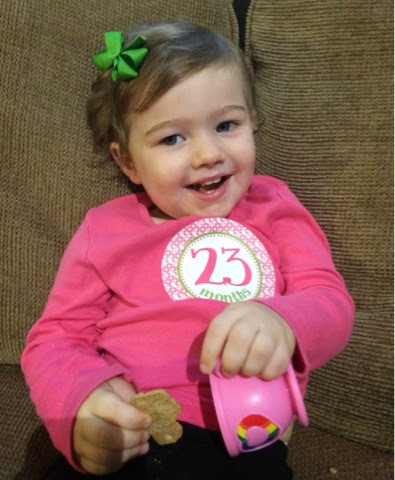 Happy 23 months sweet girl, and Merry, Merry Christmas! This season is full of such conflicting emotions. I remember as a kid hearing that Christmastime is a really, really hard time for some people, and I didn’t understand. My childhood Christmases were magical, and I think my parents did an amazing job of balancing the fun of the season (presents, Santa, parties) with the spiritual focus of celebrating Christ’s birth. I remember specifically one year coming out of Christmas Eve service and being absolutely certain I saw Santa’s sleigh flying over the cross on top of our church. I want this for my kids too- I am absolutely pro-Santa, but I want him to always be flying over the cross on Christmas Eve. And perhaps I’m doing a decent job of that already- I’ve been talking about the nativity with Charlotte, and she knows the story, and the characters, but anyone with a beard is still “Santa- Ho Ho Ho”, so I’m letting Santa hang out by the manger as long as he wants. As an adult, I now understand why Christmas is hard and isn’t all magical. Today, I’m less stressed (shopping is done- sigh of relief) and more sad. I’m not depressed- I’ve dealt with that and this is different- but I am sad. I’m sad for my sweet Grayson, that even though he is present for so many Christmas and family activities, he misses out. He misses out on so, so much. Grayson won’t be with us at church on Christmas Eve- he’ll never hold a candle and sing “Silent Night”. He’ll be at home asleep while we’re opening gifts Christmas Eve with Ryan’s family. We’ll never have that “ideal” Christmas morning, where all our kids run out to see what’s in their stockings and under the tree, and just like so many other things, I’m having to grieve the loss of that dream. And yet, he’s here, and I never want to take that for granted. A few weeks ago we saw his doctor who brought up his latest brain MRI. His disease has progressed- the damage to the white matter in his brain has increased since last year. Grayson’s body, his brain, is failing him, and all we can do is love him. No perfect present or ideal Christmas morning is going to change that. We’ve had some incredible, unexpected blessings that have shown up in our mailbox and inbox, and people’s generosity humbles me with gratitude. 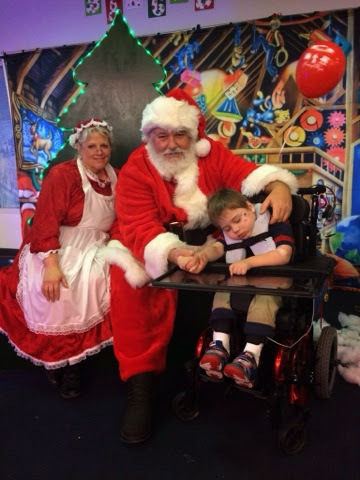 Thank you to our friends who have shown us such love this month and put some of the magic back in Christmas. This next week, I’m going to make every effort to enjoy this time of year- to sing “Happy Birthday Baby Jesus” with Charlotte, snuggle with Grayson, and laugh a lot while opening presents with family. Merry Christmas everyone- I hope yours is magical. 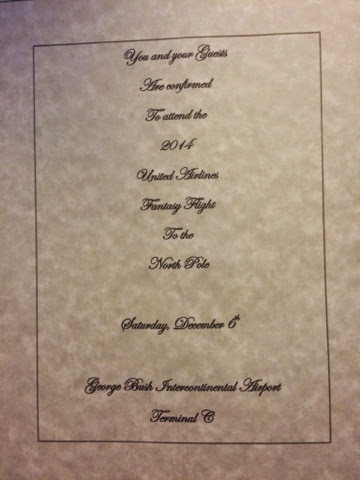 We Flew to the North Pole! We had a magical Saturday, and I’m still tearing up when I think about it. 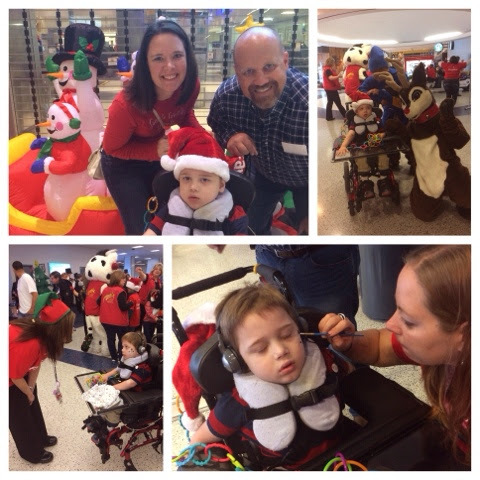 A few weeks ago, Grayson was invited to attend the United Airlines Fantasy Flight to the North Pole. 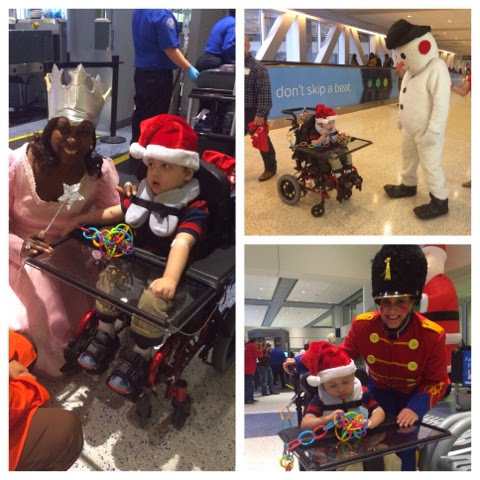 United invites children with chronic illnesses and their guests on the once-a-year flight, and every detail was perfect. 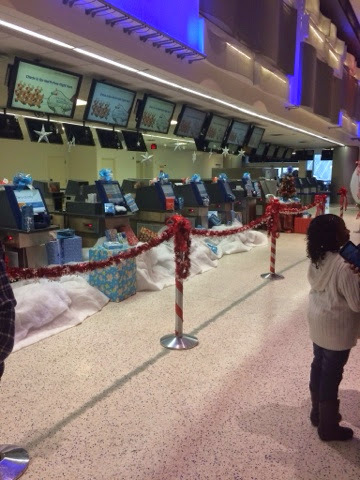 We arrived at the airport yesterday morning and were greeted by an army of volunteers and an over-the-top decorated check-in area. 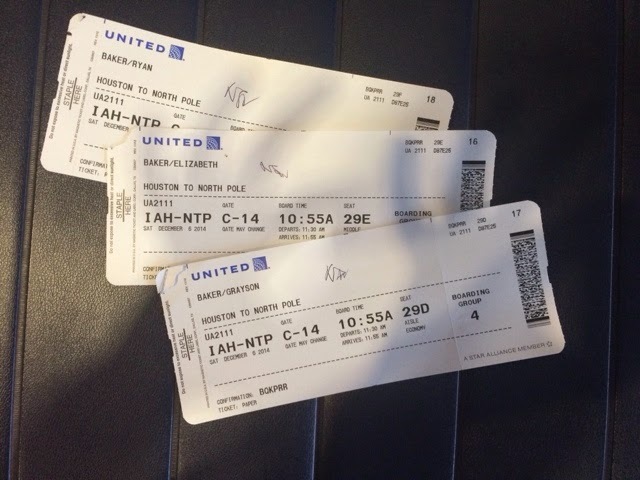 We checked in, got our boarding passes, went through security, and made our way to the terminal. We could hardly take even a few steps without being greeted by another character. Everyone was SO sweet and just doted on Grayson. 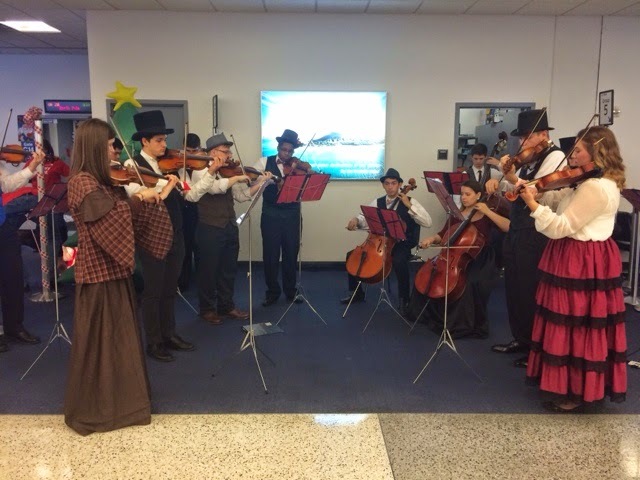 When it was time to board, we followed the crowd to the gate, where we were greeted by an orchestra playing Christmas music, and a fully decorated gate. They had the kids in wheelchairs board first, and were so helpful while we got him out of his chair and into the plane. The first thing we did when we boarded the plane was visit the pilots in the cockpit! 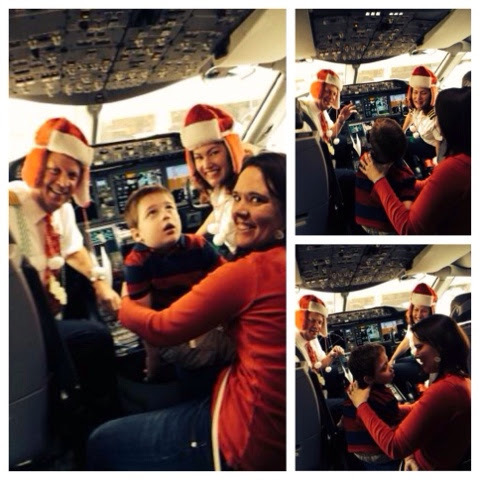 Same as everyone else, they were so sweet to Grayson and we could tell they were genuinely honored to be the ones flying us the the North Pole. We then made our way to our seats. The plane was huge, new and gorgeous. 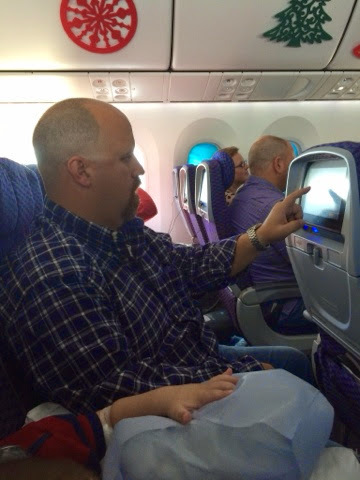 Ryan was especially impressed with the touch screen on every seat. 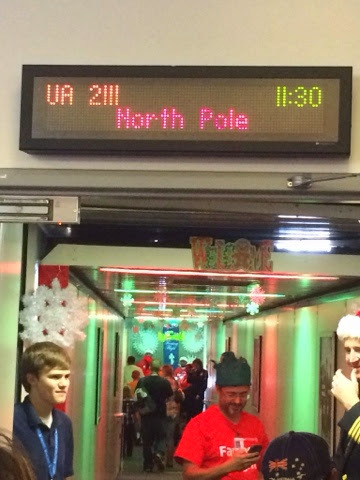 The atmosphere was so happy and festive, and when the pilot annouced we were ready to take off to the North Pole, everyone cheered. We took off (yes, we actually were in the air for about an hour) and a few minutes later it was announced that the crew had been working with Santa’s engineers to design a propulsion system allowing us to travel over 4,000 miles to the North Pole in less than an hour. Amazing! 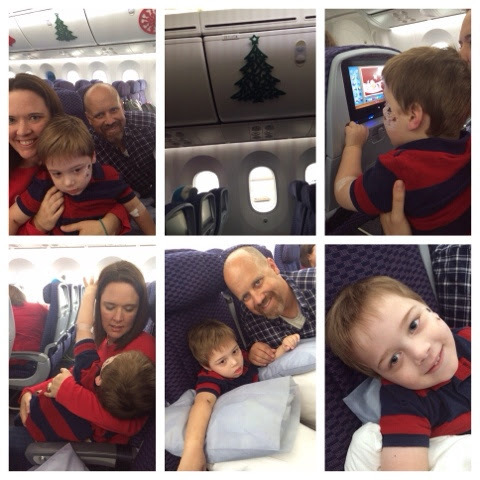 I was a little nervous about how Grayson would do on the flight, but as usual, he rose to the occasion. He did awesome. He had his headphones listening to his Veggies and he was totally happy almost the whole flight. 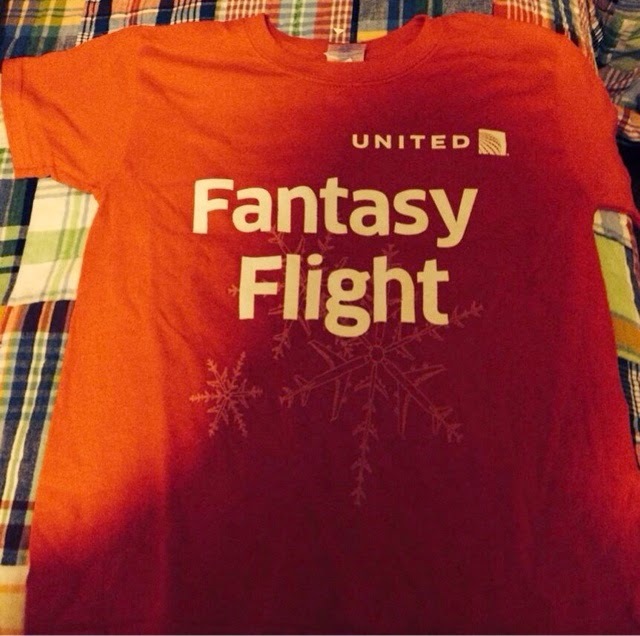 The flight attendants were awesome too. They were so sweet and excited, handing out special bags with treats and serving drinks. 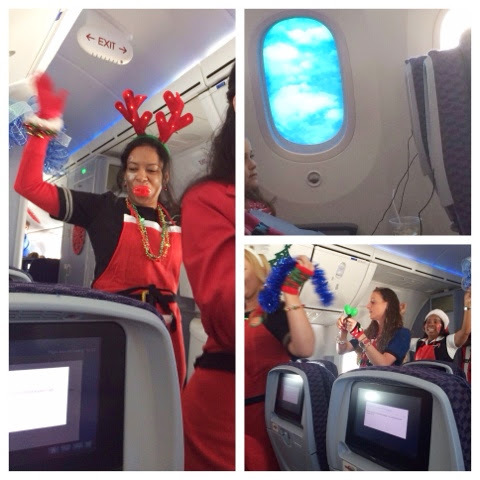 Towards the end of the flight, they played Christmas songs over the sound system and danced and sang down the aisles. We landed, and when we exited the plane into the North Pole, we were greeted by cheers and a receiving line of volunteers. 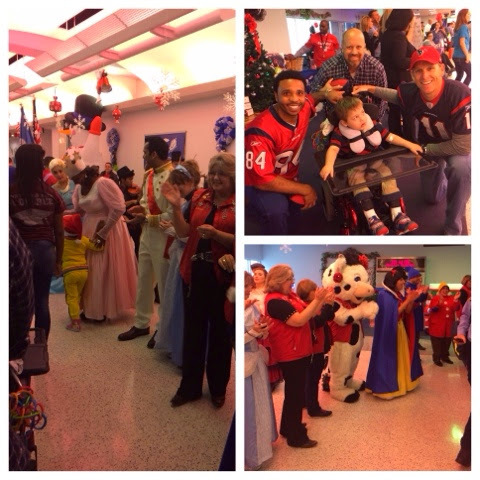 The North Pole had decorations, food and drink, a choir, orchestra, lots of presents, two Houston Texans, and of course, Santa! 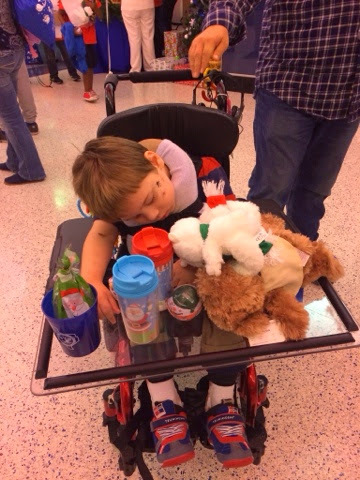 Poor Grayson barely made it back into his wheelchair before he was sound asleep. Even though he was asleep, we still got a good picture with Mr. and Mrs. Claus. Santa spoiled Grayson (and Charlotte, they gave us two of everything) with sweet gifts. We are so, so grateful to United Airlines, Chevron (who donated the fuel) and our Mito clinic for this incredible opportunity. I don’t know how much of what was going on Grayson was aware of, but on some level I know he realized it was someothing special and felt special and loved. It was such a wonderful day and will definitely be a highlight of this holiday season. 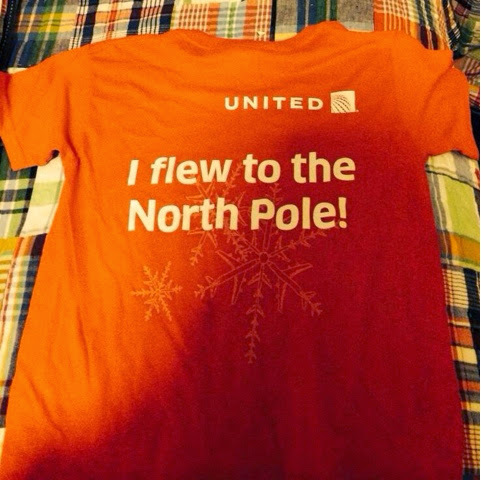 And how many kids can say they’ve flown on an airplane to the North Pole?! Well, it’s been nearly a month since I wrote a real post. We’ve had a lot going on, but I just haven’t been motivated to write. I have a lot on my mind, but not much I can write about here. I’ve been hurt by a few comments in the past few months, and it’s made me a little gun-shy to write about certain things. And I am completely aware and accept that writing a blog opens me up for criticism and people’s opinions, and it’s hard to reconcile the two- wanting (and needing) to write, but also protecting myself and my confidence in our family’s decisions. The thing about honesty is it sometimes leads to really awkward situations. I’ve been making a conscious effort to be more honest with people, meaning, instead of making an excuse, I will tell the real reason why I can’t do something or am going to do something else. Several times, this has backfired- nothing major, but just some uncomfortable conversations or slightly hurt feelings. And I think that maybe it just would have been better to tell a white lie. Sigh. Finances are particularly hard to be upfront and honest about. This time of year is SO expensive, and incredibly stressful for me. I dread December. Gift giving is not my love language (neither giving nor receiving) and having little extra money to buy gifts makes the whole thing really hard. And being honest why I can’t attend certain events I think leaves me and the other person kind of embarrassed. I wish “I can’t afford it” didn’t have to be such a shameful statement. But the holidays aren’t all bad. We’ve been singing Christmas songs in the car (my radio is broken and we can’t afford to replace it, ugh) and it’s so cute to hear Charlotte learning my favorites and singing along. We actually decorated the house a few days before Thanksgiving, and that feels good to actually have done it and to see the ornaments I’ve collected over the past few years. I have A LOT of dog ornaments- ha ha. We have a little nativity and I’ve been talking to Charlotte about the Christmas story. Somehow, she’s got it in her head that both Mommy and Santa were at the birth of Christ- who knew?! We have an Elf on the Shelf but he’s still in his box- do I really want to start that craziness when my kid isn’t even 2 yet? I took Christmas card pictures the other day, and I got a great shot within about 3 minutes. No stress. 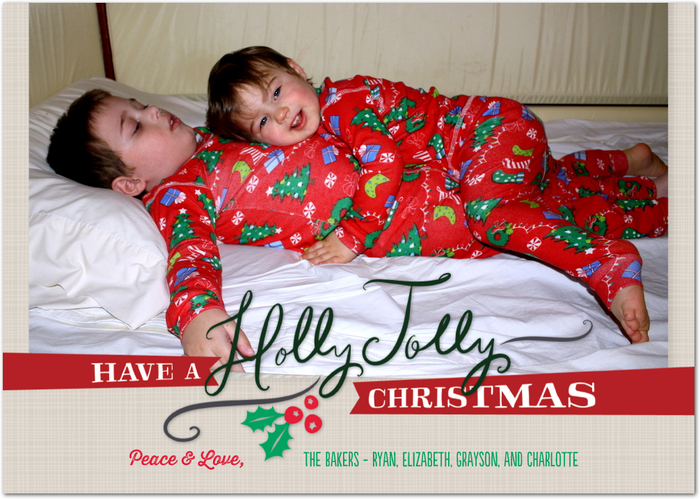 Instead of trying to pose my crazy toddler and kid that can’t sit up on his own, I threw them in matching Christmas jammies and had them cuddle in the bed. Precious. And done. I can’t wait to show you. I’m struggling with presents for the kids- with the idea of being fair. I’ve bought Charlotte several things- not a ton, because the last thing we need is more clutter in here, but some things I think she’ll really like a play with. 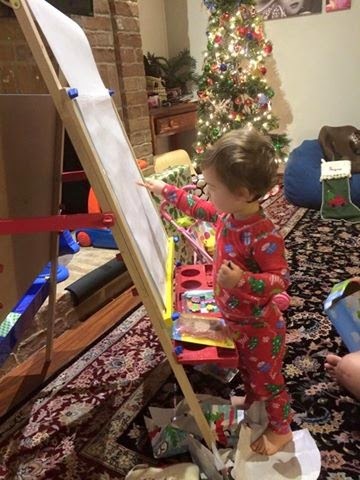 She’s really into coloring right now, so I got her an easel, art supplies, and of course, stickers. I also got her a stroller for her baby dolls, a purse, and I think I’m going to get her a potty seat (yikes, here we go). For Grayson, the only thing I’ve bought him is a little toy electric piano. 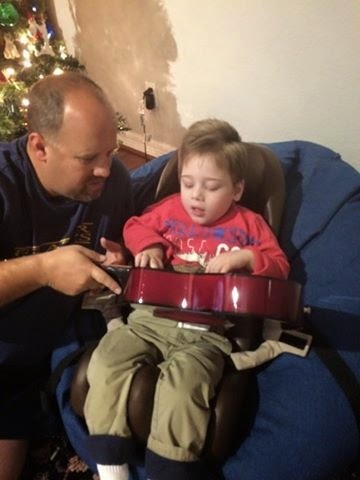 I’m thinking of getting him a guitar too, because that’s what they tell me he likes the best in music therapy. But after that, I’m out of ideas. I can’t afford to buy him stuff just for the sake of giving him presents, but I feel awful that his Christmas morning pile is going to pale in comparison to his sister’s. Logically, I know it’s just the reality of his situation, but it still hurts, and makes me feel guilty. Did I mention gift giving totally stresses me out? There’s some honesty for you. Grayson had a tube change today. The best thing I did was schedule the procedure before the tube broke on its own and forced us to the ER. 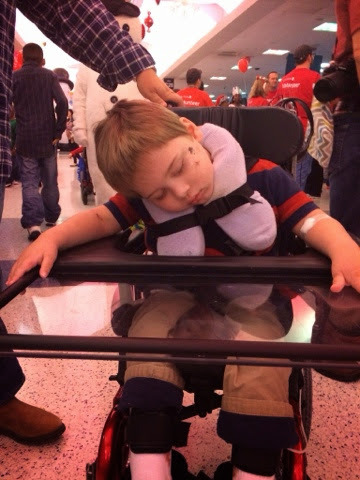 He is participating in a research study for Mito patients on anesthesia- so more than likely the drug he got today was something different than his usual protocol. I was a little nervous, but he did great- he was actually awake by the time I got back to the PACU- that has never happened before. I didn’t realize that being in the study requires a follow up with his doctor tomorrow as well as blood draws tomorrow and Saturday- ugh. He has been on oxygen at night for several weeks now. His nurse reports that he’s sleeping better on it (although on the nights she isn’t here, that doesn’t seem to be the case) and he hasn’t had any seizures since we started, so I guess it’s a positive thing. He hates the nasal cannula though, and even fights me putting it on him in his sleep. Overall, Grayson is doing really well right now. He’s just the sweetest, cuddliest little boy and he loves to laugh. And I do think he’s happy. And we are so excited about a special opportunity he has on Saturday- I will post more about that this weekend! We got rid of Charlotte’s bottle this week- cold turkey. Eek! Last weekend at the ranch, she refused to drink her bottle because the brand of milk was different than we have at home. So when we got home, after 3 days of no bottle, I asked her if she wanted to say Bye Bye to her bottles. She agreed. She hasn’t made one peep about them until tonight when she requested one. But I told her that remember, we said Bye Bye to the bottle, and that was ok with her. She is having a lot of trouble falling asleep though. We do a story, talk about our day, and prayers and she’s fine until I put her into bed. Then screaming. I’m totally letting her cry it out because the last thing I need to start is bedtime shenanigans. Hopefully this off-and-on screaming for an hour won’t last too long. It’s so weird to me that she is slowly letting go of her “baby” things. 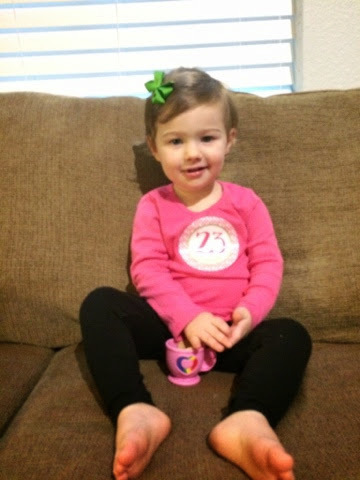 She’ll be two next month. Two! I hope you all are doing well and that these last days of 2014 find you happy, healthy and as stress-free as possible.